With ideas, requests, and pieces of feedback streaming onto your Insights board from so many sources, you'll want to develop a process to efficiently process them all. No matter what, you'll benefit from having all these inputs in one centralized, searchable repository. But investing some time in highlighting and categorizing insights will pay dividends down the road when you're prioritizing and designing feature ideas. When new notes arrive on your Insights board it's typically the responsibility of a product manager to process them. In most cases that means highlighting interesting insights and linking them to related feature ideas. 💡Decrease your workload by sending colleagues & customers with feedback and feature requests to your Portal. When insights are added to a Portal card they'll automatically be highlighted and linked to the associated feature when they arrive on your Insights board! Contributors (sales, marketing, customer success) can even vote on behalf of customers on the Portal. When new insights arrive pre-linked to related feature ideas, it means less processing for you! Develop a standard tagging procedure with colleagues on sales, support, and customer success who are inputting new notes via Intercom, Zendesk, the Chrome extension, or right from within productboard. For example, if they tag notes by product area, it could help you find just the notes that relate to features you manage. If colleagues and other contributors are creating notes directly from within productboard, they can assign you as the note owner to ensure you see it. When you're processing notes on the Insights board, process similar types of notes together. If all the notes you review in a single sitting relate to a single type of customer or certain area of your product there will be less context switching required, and you'll be able to quickly link insights to similar types of features. Advanced search options on the Insights board allow you to zero in on certain types of notes in your Inbox and process them all in one sitting. One of the things that can slow down processing notes on the Insights board is difficulty finding the right features to link insights to on the Features board. Here are some tips for optimizing the organization of feature ideas. Rather than create a new feature idea for every new user request ("User can't find export button" "User confused what 'print' button does", "Export data to PDF", "Export data to email"), lump many related requests under a broader feature, need, or topic ("Help users easily share data with colleagues"). You can always break out these needs into multiple feature ideas later (see below). Occasionally review the features getting the most requests. If you notice they've been used to capture many insights related to several distinct needs then break them out into multiple features and re-link the insights. If you already have many granular related/redundant features added to your Features board, you can merge them. Reviewing your Features board regularly will give you an opportunity to clean up duplicates, reorganize your hierarchy, norm with PM colleagues on feature naming, and refresh your memory on how features are named/organized. Archive features that you know you won't be working on in the foreseeable future because they're not viable/feasible or are not aligned with your current strategy. 💡Speed up processing with keyboard shortcuts. Use arrow keys to advance to the next/previous note in your Inbox. Use the space bar (in conjunction with the arrow keys) to quickly multiselect several notes and apply a bulk update. Press S to process/unprocess the selected note. Press T to add a new tag. Press A to archive a note. Press DEL to delete a note. 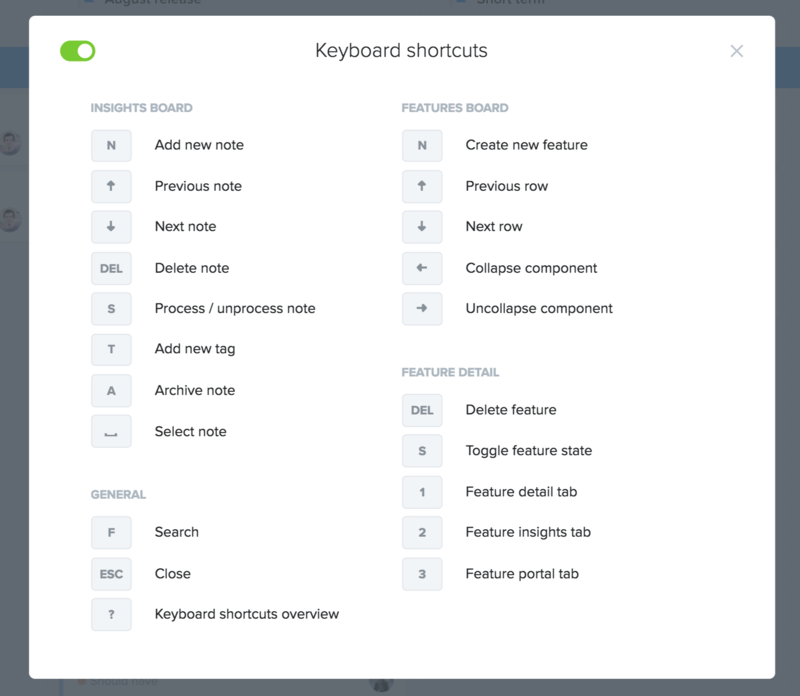 In productboard, type a question mark to view all available shortcuts. Hire a user researcher, associate product manager, or intern! Organizations that face large volumes of inputs from customers/colleagues may see the value in finding gold nuggets of user insight admidst the waves of incoming feedback, but struggle to stay afloat. In this case, many organizations have found success by adding an additional layer to the process: a team of user researchers dedicated to analyzing trends in incoming feedback (and also proactively seeking more feedback on certain topics). Effective user research is an art, but if your main goal is triaging feedback and ensuring it gets routed to the right person, another option is to make this the responsibility of an associate PM or product management intern. There are few better ways to get acquainted with a problem/solution space, industry, or the product management profession by reviewing hundreds of pieces of feedback streaming in from customers. Associate PMs can serve as an initial line of defense by clearing out less relevant inputs, processing feedback on well-understood topics or those that are less important/urgent which the PM does not need to review. 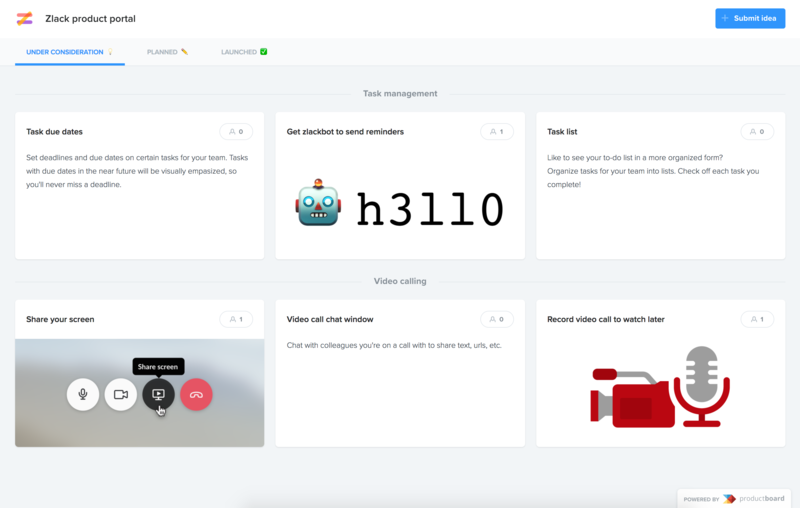 ➕Have ideas for how to make productboard better for processing ideas, requests, and feedback at scale? Submit your ideas on team productboard's Portal.